In the vision exercise called palming, you attempt to see complete darkness. The idea is that when the eyes and brain are struggling to see, the muscles overwork and the optic nerve is constantly irritated, so that even with your palms blocking out all light, you see persistent flashes. It can be a challenge to relax and let the darkness happen, but when you stop trying to see, you become able to see more clearly. What would it be like to let complete darkness happen? What would happen if we turned out all the lights? What would it be like to truly rest? Clark Strand’s thesis is that artificial lighting is the fundamental evil behind every form of human trouble, and that before electric lights came into use, humans did truly and deeply rest, reaching a state of grace every night that we rarely if ever experience in the modern world. I had already heard of this, that people used to go to sleep early in the evening, wake and go about quiet activities for two or three of the wee hours, then sleep till dawn. Apparently there are many written references to the “first and second sleep.” There was also a fascinating experiment, described in the book, in which subjects were kept away from all sources of artificial light for a month, and they soon developed that same pattern of sleep. Throughout his life, Strand has awakened and walked outdoors during that hour, in all settings and all weathers. Even as a child he did this, and he claims that he has never gotten into any serious trouble. He never takes a flashlight— it seems that his vision is exceptional. He experiences darkness as a friendly and nurturing presence. I can relate to this, even though it is more natural for me to reach the Hour of God simply by staying up till then, not by waking after a period of good sleep. When I was little my mother, also a night person, taught me not to be afraid of the dark, and told me that it was comforting and peaceful. I took that feeling in early, and I still have it. I partake sometimes of that clarity that Strand talks about, where suddenly thoughts come together in a new way, answers click into place, and poetry may arise out of the depths. Of course I am often doing this in an environment that includes electric light, so it is not quite the same thing. Lately I have been reducing the intensity of light as much as possible, though; I started that even before reading this book. One aspect of that was my purchase of a Kindle, essentially an electrically-lit book. I’d been reading e-books on my laptop, and both the heat and the light generated were irritating at night. The Kindle is much gentler that way, and besides it uses less power. A little way into the book, which I was borrowing, I decided to buy my own copy, and perhaps ironically, I bought the Kindle version, thinking how much Strand would disapprove of this self-lighting of his book. Yet, this allowed me to nestle in my bed, wrapped securely in the dark, like a child reading with a flashlight under the covers, instead of being flooded with the light I would need to read a print book. As valuable as Waking Up to the Dark is, in some ways it goes seriously wrong. Strand mentions teaching his kids about our prehuman ancestors, and he has apparently read a great deal about them, but it seems to me that he has missed some important understanding. If I read him correctly, he believes that the introduction of fire into our caves was the beginning of our sense of separation from the rest of Nature, and the hubris that causes us to want and expect dominion over her. (He even states, based on someone else’s book, that fire is responsible for the fact that humans reproduce year-round. I would be extremely surprised if there were any evidence for this, especially since our close primate relatives also mate at any time of year despite an utter lack of firelight.) The use of fire far predates the existence of Homo sapiens. Can we confidently attribute a modern human imbalance to people who were a completely different species, beings we know next to nothing about? What kind of hubris would that be? Strand also seems to ignore the fact that even now, people in traditional cultures feel themselves to be part of the natural world, co-equal with other creatures, not set above them. That must have been the norm everywhere in the relatively recent past, up till no more than a few thousand years ago. I find it a bit confusing, too, to be told first that modern electric light is the root of all evil, and then that the trouble started even with ancient firelight. Discrepancies like this may stem in part from the fact that this book is based on years of recorded experiences, during which Strand’s ideas must have evolved and shifted. Strand reports that his wife, Perdita Finn, wove the book from material in his 59 notebooks about rising to walk at night. Perhaps a few threads were crossed or twisted in the process. The last part of the book is focused on something that, despite my not-entirely-different experiences, gave me rather a turn. I referred to Nature as “her” above for a reason: that is what Strand encountered, or rather, who. As he progressed with his exploration of the depths of night, at some point the darkness itself, the Yin principle one might say, began to visit him in the form of a beautiful young woman, three-dimensional, visible, audible, and solid to the touch. When he first saw her, her lips were sealed by a creepily evocative X of black electrical tape, which she wordlessly pleaded with him to remove. Sometimes her appearance would change. He recognized her as Mary, Isis, Sophia, Diana, the Shekinah, the Queen of Heaven, and especially the Black Madonna. In all cases, She is the personification of Earth and Nature, the Mother we all come from and who we ignore at our peril, the feminine essence that so many human societies have suppressed with desperate force. When Strand realized it was time to understand Her destructive and terrifying aspects, he discovered an image of Kali. He describes the Hindu view of the Kali Yuga, a stage of destruction that is necessary in order for a new cycle of creation to take place. He sees this as natural and inevitable, but at the same time, he believes that we are bringing it about through our insanely imbalanced technological way of life. Turn out the lights, he says, and all will be well, because we then will understand how we should live and we will save ourselves and the earth. But here is another source of confusion. “The night is a natural corrective to that most persistent and persuasive of all illusions: that human consciousness is the reason for the world.” (p.96) I understand what he means, but human consciousness is, at the very least, the reason for the world that we experience. There is nothing more fundamental than consciousness. Further, our consciousness is not separate from that of the planet and its other inhabitants. This is the very same interconnectedness that Strand says we will experience if we turn off the lights. Are human thoughts and activities truly in opposition to Nature and the Earth, or are they the working out of the path and destiny of the planet and actually in divine order? Complex arguments could be made about this. I tend to think that if something, anything, is happening, no matter how dire it looks, it is part of the overall Plan and would make sense if we could see the big picture. On the more hopeful side of this idea of harmful entities, someone told me the other day that a channeler she knows had been told that as of the end of 2014, the “good guys” had removed a whole lot of those beings from our planet, and there was a big positive shift going on because of it. She used Pope Francis as an example of movement in the right direction. I don’t know— I’d like to think that’s true, but I don’t see much basis for it. Meanwhile, I await further guidance. Which may have arrived already, two weeks ago, on the day I started writing this. It was October 6. Everyone knows businesses don’t start playing Christmas music till Halloween! This was obviously a mistake, and was immediately replaced by some very ordinary hip-hop. Or it wasn’t a mistake at all, and it meant that She was listening. Synchronicities have been coming thick and fast lately. I had my laptop with me, and I opened it to find an email from Steve Bhaerman, my dear old Swami, describing how he had lost his voice right at the beginning of his tour of the Southwest. He concluded that he needed to shut up and listen. “You need to listen to that still small voice inside… that’s still small, because you DON’T LISTEN. You need to stop the endless rat-a-tat-tat of thoughts, and listen to the silence.” Listen to the Silent Night. In the dark. One might wonder where the Father and the Son in their own various guises fit in with the story— those in whose name the Mother’s lips were misguidedly taped shut. They haven’t gone away, but as Strand points out, fathers cannot produce sons without mothers, no matter how much the patriarchal religions would like to deny mothers their due. Yang cannot exist without Yin, as we all know, and there is nothing so Yang as our current America. Swami Beyondananda, who always travels with his wife, says that when a society is based only on masculine energy, we have a stag-nation, so we need the feminine energy to make a doe-nation in order to create the imagi-nation that builds the world. When I read Strand’s chapter about the apparitions of Our Lady, as usual it was very late at night. I put down the book and turned in, and I could feel myself as partaking of that essential feminine principle, being, in myself, a source of creation. This principle lives in males as well. I’m not sure that we have to turn off the physical lights in order to find Her within ourselves and return to our Mother, whom we have never really left. The photo above was taken when I visited Paris in the fall of 2010. 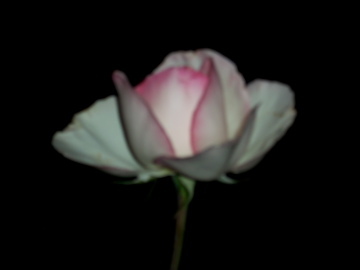 A rose– symbol of Mary. Growing behind the cathedral of Notre Dame– Our Lady. In the dark. Thank you for this beautifully written and thoughtful post. Interesting post thanks Elene. I made a similar post a while back about the way our ancestors used to sleep. I note that some of the male composers and poets in the 18th/19th centuries used to talk about “The Muse” who was always described as female. Elene, very interesting. I’ve sometimes wondered if the greater light and noise we have in our lives today has something to do with the decline in trance mediumship over the past 100-150 years. When there was less light and noise, people seemed to be more able to achieve the trance state and to further develop it. I recall times as a boy when in a mountain cabin and having nothing to do but sit in front of a warm fire that I could almost self-hypnotize myself. Of course, fire provided light, but it was a light to focus on, whereas now we are surrounded by light. Any thoughts on that? Makes sense to me, Mike. Of course, the author seems to see even firelight as a problem, but that was surely nothing like the artificial light that permeates our lives now. We have an assumption within the Asian medicine tradition that it was much easier in the old days for people to notice the points and meridians in their bodies than it is now because these things were more obvious while sitting quietly. Those who were curious and were trying to work out the system could observe the patterns over a period of time with fewer distractions.